This review is from a “mystery sample” a friend gave me. I don’t know when he opened the bottle or when he bottled the sample. Finish: long and lingering, peppery, a slight chalkiness, a vegetal note lingers and a lovely green apple note appears at the tail end. With water, there’s a slightly herbal note that appears on the nose, almost like menthol. There’s also more brine, like sea water washing over a rocky shore (I swear I’m not trying to be pretentious). With a bit of resting time, the nose takes on a meaty aroma, like salted ham (prosciutto?). Water doesn't tame the arrival on the palate at all. The salty meaty notes remain, but the ripe banana takes over quickly and is more pronounced. The finish isn’t as chalky, and the green apple note is more evident, appearing sooner and lasting longer. I prefer this with a bit of water (1/2 teaspoon). I left the half the sample and did a few things around the house. When I returned to it about 30 minutes later, it had mellowed considerably and the green apple on the finish was far more evident. Shame on me for not waiting long enough at first. I’m thinking this is an ex-bourbon Cask because it has ripe banana notes lacks the raisins/walnuts/cinnamon notes I associate with ex-Sherry casks. 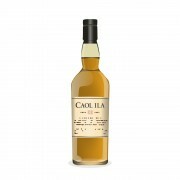 I’d guess Caol Ila Unpeated Cask Strength, either the 18 year old or maybe the 15 year old. The lingering green apple on the finish, as well as the light peat (even though it’s “unpeated”) are what point me to that guess. But I could be totally wrong. I have yet to meet a Caol Ila I didn’t enjoy. OBs, IBs, peated, unpeated. I like it all. I should find a bottle of this stuff. Great review! Is this the stuff that was available for about 30 seconds at the ridiculous price of $102? I wonder how this compares to the 17YO. It must have a resemblance or you wouldn’t have mentioned it in your guess. @Nozinan I found less caramel/toffee sweetness in the 18. The ripe banana on the palate and the green apple on the finish, especially with water, were more dominant in the 18. The bottle indicates "refill American Oak casks" -- thank you for the review, this bottle was gifted to me and I've never had Caol Ila before -- now I'm so looking forward to this! I wonder if it's one of those I ought to save for a special occasion since (I guess) this bottle is a bit hard to come by or if I should just open it up and give it a go. @archivist, in my opinion, it's not one to save for a special occasion—but if you've never had any Caol Ila before, I think it'd be worthwhile to dip into a standard peated 12 OB before turning to this variant. Sounds fun! @archivist I second all of which @MadSingleMalt just said. @MadSingleMalt @Victor Thank you for the tip - I've never had Caol Ila before so I'll give the OB 12 a try first and go from there. Indeed this will be fun.